I do not write non-fiction often. 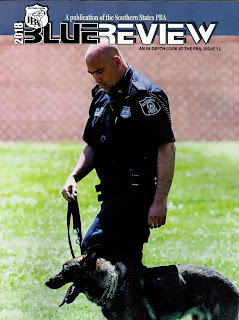 The current issue of the Southern States Police Benevolent Association, BLUE REVIEW (Issue 12) has my article THE WRITER COP. Thought I would share a portion of it here. We know the life. We know how a police officer thinks, how a cop talks, what a cop will do and we write from there. We are eye-witnesses who must learn how to write good fiction to get the stories out there. So, we start a little ahead but until we learn how to write, all we have are anecdotes. It is hard for us to cut corners in our fiction, just as in real life. We have to solve the crimes as real cops do and sometimes it isn't interesting. That's why learning to be a good fiction writer is paramount. We have to know how to add excitement to mundane procedures. The dean of our field, Joseph Wambaugh, taught us this lesson we should never forget. Another disadvantage is publishing's perception of police officers in fiction. Some agents and editors think television cops are real, that cops beat up prisoners all the time, violate people's rights, shoot everyone they can. Real cops like that end up in a penitentiary. Then again, a good story outranks reality. We are writing fiction, so when I read about a cop who is over the top, well that's fiction. It's just a little harder for us to write that way. We need to learn how to do this effectively. My recurring character John Raven Beau is larger than life and has shot far too many people in my fiction. It took a while, but I learned. A well-plotted scenario will allow the writer to create memorable characters, unforgettable scenes, uniquely described settings; so long as the writer does not forget normal police procedures. Deviation from the norm removes credibility from your story. Strive for believability. Although real police investigations include long, sometimes grueling days of unending canvasses, surveillances, and dead-end leads, you should be selective in what you present the reader in order to keep your story moving forward. Short scenes featuring crisp dialogue can streamline the most mundane parts of an investigation. Leave out the boring parts. As in almost all fiction, character is the heart of the story. Although the hero of the police procedural is usually a police officer, they are real people existing in a familiar world. What happens to them can be extraordinary. The setting is the skeleton your story is built around. It is more than just the description of a place or time period. It is the feeling of the place and time. Give the reader a distinct, well-rounded setting stressing sensory details – the sharp smell of gunpowder, the coppery taste of blood, the tacky feel of rubber grips on a weapon when the hero's hand are sweaty. Through dialogue, you have an excellent opportunity to create emotion, from scintillating nails-on-a-blackboard passes uttered by creepy villians to hard-nosed talk between overworked detectives. Use what you know. You know how a cop talks. Make sure of your facts. We all know revolvers do not have safeties nor can a silencer be effective with a revolver or any open-breech weapon. Detectives take notes. How many times have you seen a movie or read a book showing detectives taking notes? Not many. I've been a detective most of my career. I never shot anyone but I killed a lot of pens. A pen is a detective's most useful took and mightiest weapon. Every killer on death row began his or her long trek through the criminal justice system with a detective taking notes at a crime scene. Don't cheat the reader out of an ending to your story. Police cases end, usually with an arrest and trial, sometimes with a shootout. This is a natural, climactic event. Even cases that are suspended or closed without a solution have a climactic moment, when the investigators face the nightmare of someone getting away with murder. In your resolution, you should remember something is usually affirmed. Good triumphs over evil, or at least goes the distance. O'Neil, have you watched The Rookie (new show this year on ABC)? I don't know how accurate it is (especially how the police come under fire in every episode), but I really like it. It has drama and humor and, of course, Nate Fillion. All good points, O'Neil. And if any of us wrote our stories the way real life is they'd be accurate but deadly boring. The first key to fiction is conflict, so that amps things up right there. We want the peaks, not the valleys of the coaster ride, even if there's a little dramatic license in there...but not too much. I am delighted to know that in real life the pen is indeed mightier than the sword. Good post, O'Neil. I'm just glad my cop is in small town SD, and they are - for the most part - a different style of cop. And Paul - you're so right about stories vs. real life. That's my problem with all courtroom dramas. In real life, even murder trials are mostly deathly dull. But that's our job - to jazz 'em up! Great post, O'Neil--I really enjoyed this. Your article in that publication is, I'm sure, just as interesting to your fellow cops as it is to your fellow writers. I have great admiration for policemen anyway, and I've always liked stories and novels written by former (or current) members of law enforcement. You guys have instant, and well-deserved, credibility. Thanks for the comments everyone. John, as for " instant, and well-deserved, credibility," That might work many places but not with a New Orleans literary community dominated by uptown dilletantes. I was always that cop who writes those little police paperbackss. I did get some good publicity from THE TIMES-PICAYUNE and WWL-TV but I never fit in with the 'serious writers'. It bothered me until I realized what they thought of me and my writing did not matter.